The most anti-Iran Democrat in Congress will be charged with corruption, and the neocons are buzzing with conspiracy theories. Word came down last week that Senator Bob Menendez would soon face federal corruption charges stemming from his relationship with a donor, the wealthy Florida ophthalmologist Salomon Melgen. You can read the initial report for details about the likely indictment, which concerns Menendez’s advocacy for Melgen’s business interests. I don’t know if the looming charges have any merit, but the story of Menendez’s career renders them not implausible. Menendez is known, for example, for receiving huge donations from the Israel lobby and, in turn, dutifully pursues its agenda. He also, as recently recounted in the Intercept by my colleague Eli Clifton and I, advocates for less savory groups that give him money, like a culty Iranian opposition group. With Menendez, it seems, money talks. And as far as the Melgen allegations go, the investigation has already borne fruit: after its details were disclosed, Menendez in 2013 tardily reimbursed Melgen to the tune of more than $50,000 for flights on the doctor’s private plane. The latest round of news about potential charges yielded a furious reaction, not least from Menendez himself, who vociferously denied any wrongdoing in a Friday press conference. But other, more surprising players, too, pushed back against the story: a host of right-wing pundits weighed in that the scandal here isn’t the alleged corruption but the potential charges themselves. This clutch of neoconservatives and other hawks suggested that the charges to be brought by the Justice Department were political retribution for Menendez’s consistent work against Barack Obama’s diplomacy with Iran over its nuclear program. Over the past several years, the New Jersey senator has distinguished himself as the Democrat in Congress most willing to work with hawkish Republicans to push legislation aimed at killing talks with Iran. The moves by Menendez sparked testy exchanges between the senator and the Obama administration, which looks to a possible Iran deal as a legacy foreign-policy achievement. All that seems to be enough to have earned Menendez a few neocons in his corner. On Friday, the retribution meme began to surface. “Mess with the Iranian nuclear bull, get the DOJ horns?” tweeted Jonathan Schanzer of the Foundation for Defense of Democracies, using the initials of the Department of Justice. Many others took a similar conspiratorial line, but none quite as hilariously as Michael Goldfarb. Having the good sense to call this sort of innuendo what it is—a “conspiracy theory“—Goldfarb nonetheless went on to posit: “Menendez prob[ably] is guilty—but they held it over him to keep him in line, and dropped the charges just before the deal… real abuse of power.” Got that? The Obama administration framed up a guilty man for a crime he probably committed. I will point out that the timing seems awfully coincidental.… It raises the suggestion to other Democrats that if you dare part from the Obama White House, that criminal prosecutions will be used potentially as a political weapon against you as well. The voraciously anti-diplomacy Senator Mark Kirk, a frequent co-author of sanctions bills with Menendez, piled on. 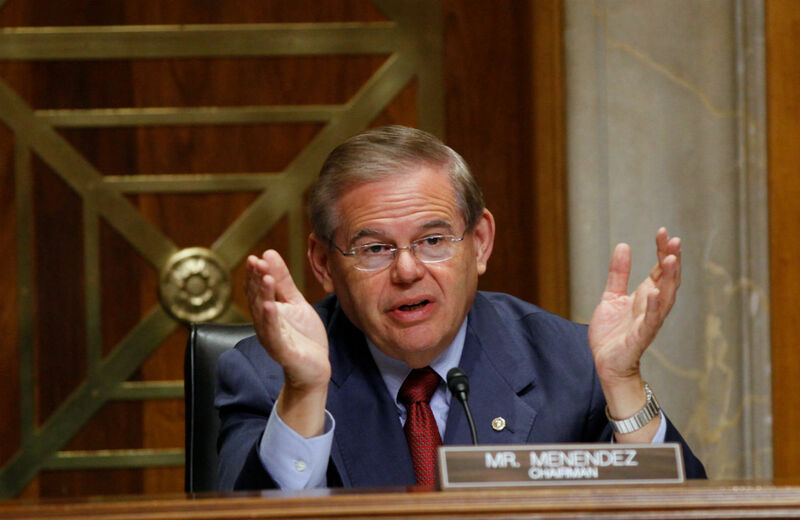 “On the eve of a bad deal with Iran, the timing of leaks makes many worry that there’s a vendetta against Senator Menendez for his many years of good work on preventing the Ayatollahs from getting nuclear weapons,” Kirk told Bloomberg’s Eli Lake. But a few relevant details cast doubt on the conspiratorial notion of Obama’s revenge. The neocon conspiracy theorists would do well to look at the timing of the investigation itself, which began before talks with Iran yielded the November 2013 interim deal that Menendez has so assiduously threatened to kill. What’s more, Menendez, though certainly at loggerheads with the administration over Iran, has proved malleable at key moments. Last year, when Obama forcefully rejected the prospect of new sanctions, Menendez backed down. He did so again recently when he vowed not to bring a vote on his own new sanctions (with Kirk) despite having gone on about their urgency. When Senate majority leader Mitch McConnell threatened to circumvent agreed-upon procedures to bring another new anti-diplomacy bill to the Senate floor—a partisan effort that could hardly have surprised the Democrats colluding with the Republicans—Menendez led the charge of Democratic co-sponsors against their own bill moving (McConnell backed down). So manipulating the justice system to contain Menendez’s opposition to a deal hardly seems necessary. The much criticized timing of the possible charges also doesn’t really benefit the administration. Menendez vowed that he’s “not going anywhere,” and spokesman added to Bloomberg that the senator planned to keep pushing his new Iran sanctions despite his recent woes. With the deadline for a framework nuclear agreement only weeks away, charges against Menendez never would’ve been acted on quickly enough to derail this sort of continued activism. The irony, of course, is that many of Menendez’s neocon defenders (though perhaps in Goldfarb’s case, that’s not the right word) frequently deride Middle Eastern cultures for their conspiracy theories. They ought to then know better before they spout off serious accusations of criminal wrongdoing without any evidence. One can only presume, in Menendez’s case, that the Justice Department has been more judicious in its investigation and with the charges it plans on bringing.